Which other West of England aviation products – including cars, missiles, pre-fabricated buildings, plastics, satellites and mobile phone technology – have been most memorable or significant, in your opinion? It is only right to celebrate the contribution of Bristol and the surrounding area to World air travel over the past 100 years. This is a fitting occasion to remind the World that Bristol has produced not only ground breaking aircraft such as Concorde but also built buses, cars, satellites, missiles etc. which we still depend upon today. As a pilot and owner of a Bristol car I am only too well aware of the historic legacy left behind by Bristol. The BAC heritage is something we can all be very proud of. I'm in no doubt that other Bristol owners will want to be associated with this project. 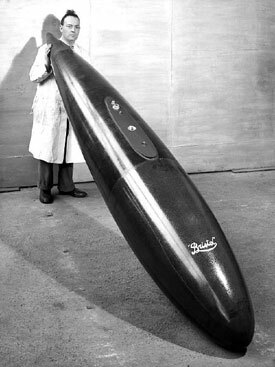 Plastic drop tank, c 1950s (Airbus).